Friends! Here is a modification that will inform you about all enemy tanks that was glare by you. If you’ve ever been curious, “Is not your glare appeared on the mini map”, “Did you not help team”? If yes then this mod is for you. This version is able to display information about all enemy’s vehicles that were glare by you. 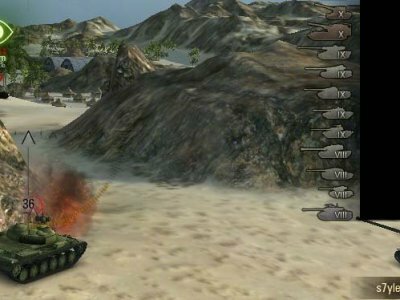 Mod will highlight translucent square enemy’s tanks on a mini map that were glare by you. Now you do not need to wait for the end of a fight to get acquainted with the results of your work on the battlefield. All this information you will receive during the battle.You can immediately calculate your points. Certainly calculate by hand is not very convenient there are damage calculators for this. It is only the first version of modification so author promises to establish a correct, automatic calculator. At the moment, there is a calculator but it does not work very well. The author promises to finalize and more modern his creation. – Lite version. In this version, there is no configuration file, where you can select such functions as: font selection, the X or Y position and many others. This version does not influence you FPS, so it is suitable for slow computers. – Improved version. This version was remade by other modder, but with the same working principle. The difference is only your glare tanks will be allocated in the form of green eyes over the enemy’s marker.